For the first time all Green Talents awardees from previous years were invited to come to Germany to attend the Green Talents Alumni Reunion in Berlin. 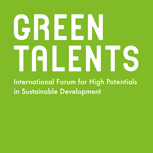 The “Green Talents – International Forum for High Potentials in Sustainable Development” is held annually since the year 2009. Under the patronage of Federal Minister Annette Schavan already 80 young researchers were given the opportunity to visit Germany’s leading institutions in the field of sustainability research through the BMBF funded programme. 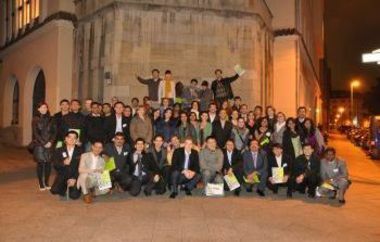 In the fourth year of the competition and on the occasion of the BMBF Science Year 2012: “Project Earth: Our Future”, which is dedicated to research for sustainable development, the BMBF had decided to hold the first Green Talents alumni meeting in Berlin. This event followed the idea of the Green Talents initiative to support the creation of an international network of outstanding researchers thinking about sustainable solutions in various fields. With the given focus, several activities were organized and conducted. Besides the internal networking aspect between the awardees from different years, it was also indented to connect the Green Talents with German experts. Therefore, the 9th BMBF Forum for Sustainability (FONA-Forum) was chosen as the perfect platform to host such an event. Scheduled at the end of the 2012 Green Talents Tour through Germany, the two days long alumni reunion started with an informal welcome dinner on Sunday the 21st of October. The next morning, the Green Talents visited the exhibition “Going Solar – Sustainable Alternatives for Tomorrow’s Energy Supply” at the Max Planck Science Gallery in Berlin before attending the official opening ceremony of the 9th FONA-Forum. In the course of the next days, the young scientists participated in various FONA activities as well as in a simulation game entitled: “Climate Engineering: Technical alternative or playing god“. The session was specifically designed for the alumni meeting and aimed at creating an interactive environment in which the Green Talents could exchange ideas on an urgent issue in the field of sustainable development. The discussion was based on a fictive scenario in which the participants were randomly assigned to different groups representing different ministries in a fictive state called “Greenistan”. In order to give the Green Talents the opportunity to present their research and projects to their peers, a conference dinner with poster exhibition was organized in the evening. On the second day of the FONA-Forum, the alumni took part in the official Green Talents award ceremony 2012 with Federal Minister Annette Schavan. Beside several other sessions the group also attended a panel discussion on the topic “International top-level research as driving force for sustainable development – Green Talents have their say”. To discuss the given topic, three Green Talents from different years and scientific backgrounds as well as three high ranking experts were appointed to the panel. All alumni activities aimed at connecting the different Green Talents generations to a unique network of high-potentials from all over the world. The exchange of “bright minds” across country boarders has always been the groundwork of international co-operation and therefore also of knowledge transfer. Modern telecommunication technologies facilitate and foster this development. However, the exchange of knowledge is based on trust between people, which in turn often depends on personal encounters. 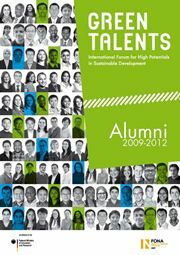 On the occasion of the first alumni meeting, the BMBF had decided to publish a brochure featuring all 80 Green Talents (2009-2012) with an updated profile. This publication shows the fascinatingly broad spectrum of different scientific and cultural backgrounds active in the field of sustainable development. Furthermore, the brochure displays the international character of the competition with awardees from 30 countries around the globe and creates therewith a feeling of the value and the unique character of the growing Green Talents network.